Invisalign offer teeth straightening with nearly invisible braces. Get a confident smile that can change everything with Invisalign treatment today. Ready to start Invisalign treatment? Invisalign will close a gap between teeth or correct goofy teeth that stick out; all this without the social stigma of wearing fixed metal braces. 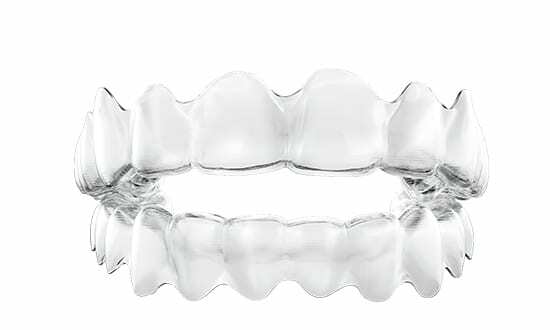 There is now a revolutionary new way to align teeth using Invisalign invisible braces. This invisible orthodontics system uses a series of clear aligners that are custom-moulded to fit teeth and gradually apply gentle pressure to reposition them over time. At the Dental Touch, we offer 3 different versions for Invisalign braces. Invisalign full – the most popular Invisalign version, suitable for many patients, especially those with complex teeth issues, as it can correct a wide range of patient concerns. Typical treatment time is between 12-18 months. Invisalign lite – operates in the same way as the traditional Invisalign full system, but is designed for less complex cases. Typical treatment time is around 7 months. Invisalign i7 – suitable for patients with milder cases, as concerns can be corrected in as little as 3 months, and the treatment consists of 7 aligners. Discrete – since the aligners are virtually invisible, most people won’t even notice you’re in treatment. During the first visit, we will address all your dental needs and concerns and assess suitability for treatment with Invisalign. If a decision is taken to go ahead with treatment, we will take bite impressions and photographs. These will be sent to Invisalign for your bespoke aligners to be made. Invisalign technology uses advanced 3D computer imaging to transform the bite impressions we send them into a custom-made series of clear and removable aligners. This is overseen and adjusted by specialist orthodontists at Invisalign. There may be as many as 48 aligners in the series or as few as 12, depending on individual treatment plans. During the second visit, your first set of aligners will be fitted. Each of the aligners should be worn for 2 weeks. We will usually provide a few additional sets to wear before each progress visit. Each set of aligners are to be worn day and night, and removed only to eat, drink, brush and floss. Your aligners need to be changed every 2 weeks as teeth gradually move. Total treatment time averages 6-18 months, but will vary from case to case. Regular visits every 6 weeks or so are required to ensure that the treatment is progressing as planned. Stage 5 – the finished treatment! When the wearing of each aligner in the series is finished, treatment will be complete, providing a perfectly aligned, beautiful smile. Invisalign Bristol | Invisalign Offers Bristol | Clear Braces At Dental Touch.